It’s a rather poorly written (idiotic) article, but what it is basically saying is that Israir is trying to beat out El Al in the Chareidi market by announcing it will have a Torah on one of its planes on its NY-TLV route. There is no question that this will help push the Chareidi market more towards Israir and away from El Al which has been showing some pretty major disrespect to one of its largest customer bases. Of course it raises real Halachic questions too, such as placement, the movies, etc. But as Israir uses Airbus they probably have the flexibility to create a small shul on the plane which resolves a lot of halachic and social issues on the flight. I flown on the smaller Airbus and wasn’t happy with the layout, but now I am thinking that Israir might be worth trying out, particularly since the NY-TLV route will probably be with a larger, newer plane and my last few flights with El Al have been unpleasant. Normally I don't reprint articles, but this was very good. Amnesty International's declared objective is a "vision of a world in which every person enjoys all of the human rights enshrined in the Universal Declaration of Human Rights and other international human rights standards." Accordingly, we have no choice but to express our deep dismay at the fact that during your recent visit to Hebron (December 2006), you did not see fit to visit the Jewish Community of Hebron and speak with representatives of the community. As we are sure you are aware, Hebron's Jewish community dates to the days of antiquity, with a continuous Jewish population for thousands of years. In August of 1929, sixty-seven Jews were slaughtered and over 70 injured by their Arab neighbors. The survivors were expelled from the city. Men, women and children were butchered, raped, burned and tortured. The ancient Jewish quarter was destroyed and its holy sites desecrated. Some 25 years ago, Hebron's Jewish community was renewed in parts of the destroyed Jewish neighborhoods; and Jewish families returned to live in Jewish homes following transfer of ownership deeds by the property's owners to the community. The Hebron Jewish community has suffered tremendously as a result of constant attacks by Arab terrorists belonging to terror organizations. Unfortunately, it seems that you are unaware of this fact, as a result of your decision to see Hebron from a very prejudiced point of view, speaking with one side only; thereby, ignoring the human rights and suffering of the city's Jewish residents. You write: "the movements of tens of thousands of Palestinian residents depend entirely on the decision of the Israeli soldiers. Often the Palestinian residents are placed under curfew, which do not apply to the 500 Israeli settlers who live in the area." This is untrue. An overwhelming majority of Hebron and Hebron's Arab residents are under rule of the Palestinian Authority. Arabs have free access to the entire city; whereas, Jews have access to only about 10% of Hebron. Also, Hebron's Arabs have not been placed under curfew in years. Curfews are imposed only following massive terror attacks in the area. When there is no terror, there are no curfews. You write: "Wire nets have been placed over the narrow alleys, separating Jewish settlers from Palestinian shops, to prevent the settlers hurling objects and excrement at the Palestinian and international visitors." Perhaps the wire nets have been placed to prevent Arabs below from hurling rocks, hand grenades and bombs into Jewish homes, or to prevent terrorists from easily climbing into the Jewish neighborhoods? You write: "We keep our visit short because it is past sunset and it is not advisable to stay in the area after dark." Why is it not advisable to stay in the area after dark? Who are you afraid of? Who told you that night is dangerous in Hebron. When was the last time an Arab was shot at or attacked by Jews in Hebron, during the day or at night? We strongly protest the description of your visit in Hebron, the conclusions you so arbitrarily reached, and the fact that you refuse to meet and discuss the issues involved with representatives of Hebron's Jewish community. Should you decide to fulfill Amnesty's "vision," as quoted above, and objectively examine current issues in Hebron, we would be happy to invite you to meet with us in order to show you, first-hand, the hardships that Hebron's Jews have to deal with on a daily basis. It would be advisable for Amnesty International to remain a neutral, objective organization and not act so irresponsibly as to draw conclusions before carefully examining the facts and hearing all the parties involved. The JP has an interesting article on Palestinian-on-Palestinian terror. You see, not only does their primitive society demand that they attack and kill Jews, but it demands that they attack and kill each other too. The PLO is demanding that the Bethlehem gunmen be allowed to return, and it might happen. Of course the Moslem Arabs are happy with the idea, but the Xian Arabs, already terrorized by their primitive Moslem neighbors are terrified of the thought. Bethlehem used to have a much larger Xian community, until Arafat started pushing the Moslem population to take it over, even to the point of building mosques in the middle of Xian areas. The JP describes how the Moslem terrorists stole from, attacked and killed a number of Xians in their reign of terror, as well as mistreating Xian clergymen. Caroline Glick even describes how the Moslem Palestinians stole from the Church! And such good Moslems too, drinking alcohol and using the Xian Bible as toilet paper. Well, we can't expect much more from them or their supporters anyway, can we? I only had my camera phone with me, so the quality isn't that great. Can anyone find the elephant in the room? Israel is now releasing $100 million dollars to the Hamas run government, removing lifesaving roadblocks, giving the Palestinians yet more weapons (after all they shot off over 2000 bullets in the space of 10 minutes today) and will be releasing more terrorists as part of the terms of surrender that PA President demanded of Olmert this Saturday evening. In exchange, the Palestinians will continue to launch missiles at Israel and not even provide information regarding Shalit. Ha’aretz reports that Palestinian flags decorated Olmert’s official residence at Aliza’s request– presumably so that Abbas could get the feel for what his new home in Jerusalem will look like after the surrender is completed. Abbas announced that he expects the PLO's Badr Brigade to entering into the Shomron from Jordan in the near future. For those that aren’t familiar with the Badr Brigade, it is the armed wing of the PLO, first founded in 1964 to overrun Israel, and is made up of thousands of PLO soldier/terrorists. First of all - it’s raining in Israel. Second, Haaretz reports that Jewish families in the Hebron market that were kicked out of their homes have moved back in. Third, in a Chanukah miracle, Haaretz reports the fact correctly! Hebron's wholesale market was built on Jewish-owned land, and the original owner, a Jewish nonprofit organization, later transferred it to the Jewish community of Hebron. A year ago, however, all the Jewish families living there were evacuated. I can’t remember which idiot (they all begin to sound the same after a while) a few months ago said we must restrain from retaliating against Gaza for their missile attacks on Israel for a period of at least 10 days - this will offer Peace a chance and show them that Israel is serious. Against all common sense, that is of course what our Leftist government did. Meanwhile as missiles continue to fall on Sderot and Ashkelon, including a serious hit the other day - Israel is restraining. This government has certainly proven it’s seriously stupid, and I am waiting for that idiot (can someone please remind me of his name) to apologize for now being a proven idiot. Your theory was tested. It failed. You failed. Your philosophy failed. Can we please now move on to more constructive methods and leaders? Hat tip: Leib Schaeffer (whoever you are). I started off my evening planning to go to the Slifkin kickoff at the OU-Israel offices, but mistakenly thought it began at 6:00 and not 8:00 and I couldn’t figure out why no one was there when I got there “late”. So I then headed out to the Manhigut Yehudit conference in the Ramada where I hung out with Bone Crusher who was bouncing while we ate sufganiot. JoeSettler Jr. was getting a bit tired so we left before the end, but we heard Esther Pollard and various other heroes of the Orange movement speak as they lit the Chanukah candles. This is the first time that Mrs. JoeSettler actually heard Moshe speak about Manhigut Yehudit and its goals, up till then it was always just hello-goodbye at social events. She said Moshe spoke to the point. He stated the problems and stated the solutions. She doesn’t like politics and he didn’t speak politics. He spoke common sense. She most appreciated when he said that judges need to be elected by the people, not by other judges but she was most impressed by the young people who were introduced who had stood their ground against the expulsion and the judges who jailed them on political grounds. 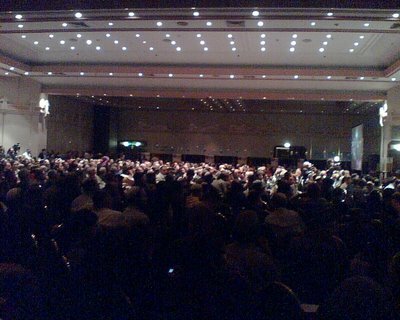 The large hall in the Ramada Renaissance was completely full. Manhigut Yehudit is growing in size. I hope now it also grows in political maturity - not so it can start cutting backroom deals with other politicians, but rather to gain experience to avoid being taken advantage of by those more experienced politicians that would use and abuse Manhigut’s powerbase by trying to cut deals and backstabbing. 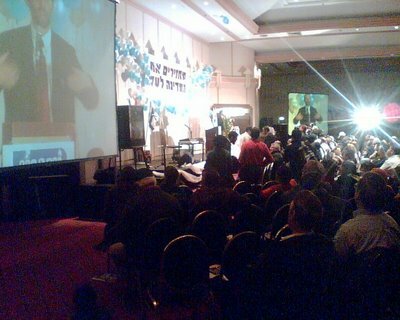 Manhigut Yehudit needs to stick to its long term plans and avoid the backrooms. 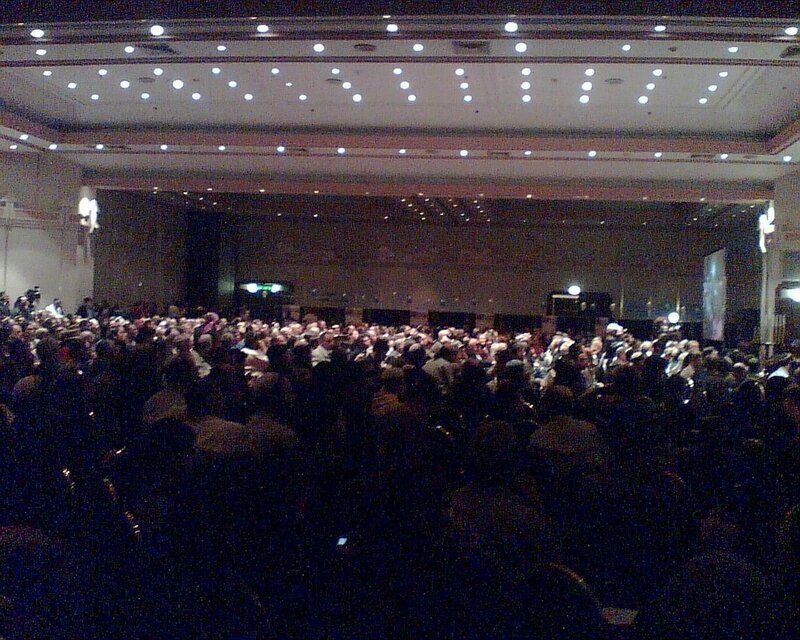 This conference showed that the people are there to build a real powerbase. Moshe – use it wisely. I find myself at a loss for words when I think about Amir Peretz and his staff. On one hand, an anonymous member of Peretz’s staff had a brilliant flash of insight (an insight I have often mentioned here). The JPost quotes the source as saying, “When the Palestinians fight among themselves their way out is always to just join forces and fight against their common enemy - Israel." But the article continues to describe how despite describing the solution, no one in the government, including the author of the comment, gets it. The comment’s author has it right, if the Arabs want to get out of their civil war they need to unite in attacking Israel. Therefore the solution is to foment the civil war among the Palestinians, not to try to quiet it down as Israel is trying to do with their “secret talks” with Abbas the terrorist and Holocaust Denier. Let them get overwhelmingly busy in killing and destroying each other that they won’t have the opportunity to try to unite and fight against us. Unfortunately, this government is worried about the stability of Lebanon and how they might shoot missiles at us (again), or about the stability of Jordan, now that baby Hussein is divorcing his Palestinian wife. Seriously, those regimes are not our problem. This government needs to get the army and our deterrence back in shape, so we can either scare the enemy into not fighting us, and then defeat them when we do. Instead it is worrying about the governments of dictators and terrorists. They can’t see the forest for the trees. Besides missiles, and a day or two here or there over the past few months, it hasn’t rained in Israel for a while now. We need it. The moshal of the scorpion on the frog crossing the river keeps popping up whenever one discusses what’s going on in the PA. And the truth is, the more they kill each other, the better it is for us here in Israel. Yes, you have a few that still want to confirm that Israel is the enemy and still attack us (like the roadside bomb found yesterday just in time, or the suicide bombers last week caught at the last minute), but overall, with so many weapons running around and so many people fighting over who has the best method to destroy Israel, it’s so much better for us that they are finally turning their weapons onto themselves in a much more serious way. I know, I hear the Leftists whining in the background wanting to get past the moderated comments, but I’ll answer you in advance (not that I need to, except you tend to ignore the obvious). It is not Israel’s problem or responsibility if they choose to wipe themselves out. They’ve made their bed, despite (or more accurately, due to) the best efforts of the misguided world, and now it means that hopefully we here can get some quiet as long as we contain their violence to their side of town. Will it spill over? Isn’t anarchy there bad for Israel? That will be Israel’s choice. Anarchy there is theirs and the world’s responsibility, not ours (as much as the Left still want and claim it to be). They have their own governments and revolutionaries and whatever else. They voted in terrorists. They continued to attack Israel. Everything has a price – even as the Left tries to deny them accountability. During the Iran-Iraq war the rumor has it that we supplied weapons to one side and intelligence to the other. If it’s true then as far as I’m concerned it was a good plan as it kept them busy with each other instead of us. Right now, we don’t need to supply either side with either. They simply need to use up their ammunition and fighters against each other as quickly as possible. The survivors will be happy to take Israel’s generous compensation offers to move to somewhere else safer. Now we only need to make that official Israeli policy and get it implemented. The big talk in the settlements lately is the government’s/army’s rather idiotic plan to introduce a false security system into the Machsomim (someone is making a lot of money off of it). The army claims it is to help the residents and secure the rest of Israel, but it’s rather obvious that it does the exact opposite. To go through the “fast lane” residents will need to call up and enter a secret code before they reach the gate. Everyone else, such as friends, guests, suppliers, rented cars, etc will have to go through the slow lane and the extra security checks (not that there won’t be extra security checks on the fast lane – just like there are now, just that they say there won’t be). Rather underhanded way to start cutting off Judea and Samaria from the rest of the country – just make it real annoying for people to visit – exactly what they did at the end of Gush Katif. A lot of residents complained, and so the Army “changed” its policy to having to call up “just” once a day as opposed to every time one wants to go through the Machsom. Meanwhile there are plenty of reports of harassment of settlers by various people manning the gates. Something I may discuss in the future. Olmert messed up on Israel’s ambiguity policy, except I’m wondering if Israel should introduce a new unambiguous policy called Second Strike. Perhaps Israel should declare that our official second strike policy will be to nuke the entire Middle East from Iran, Saudi Arabia, Egypt etc., if a single NBC weapon hits us. Scorch our earth, we’ll scorch yours forever. Israel still pretends that there is a cease-fire while Kassams continue to his us regularly from Gaza. Nothing new there. I guess this government would do that too with any Second Strike policy. The only real reason it would never work – this government has zero credibility with the enemy, and that just kills any potential deterrent. Meanwhile the Supreme Court (amazingly somehow still under guidance from Aharon Barak) has opened up the IDF to lawsuits by Arabs from Gaza. You know what? I agree, but only as soon as the PA starts paying us for damages they are causing, extra security and operational costs, and then we’ll start using their money we’ve frozen to directly pay Gazan Arabs that they’ve hurt with their continued terrorism. Finally, you won’t read this in the news, but the army has actually switched tracks and has finally begun to return to seriously training for the upcoming war against xxxxx. Actual (expensive) weapons are now fired freely and regularly in training; money is being liberally poured into vehicles and gas; and units are beginning to get new (and standardized) equipment and training with them. After years of Leftist brainwashing that the IDF doesn’t fight the enemy, the doped up giant is finally going through rehab – and in a serious way. The way it looks from where I stand, by this summer, technically we should be ready to win any multi-front war that is rushing towards us – but only if we get rid of those generals on top, and our current political leadership. What’s Up with the Neo-Nazi Left? It’s funny that the far Left in Israel see their natural allies as the international far Left. It’s just as interesting to see how the international far left is aiming to take on the role the far Right used to control 60 years ago in various fascist and socialistic countries. Under the guise of words like “freedom” and the like, the international far Left exploit these buzz words as an excuse for their overt and unconcealed anti-Semitism (which of course they say it isn’t, it’s just you Jews are so…). What’s sad is that the Israeli left purposely closes its eyes to the anti-Semitism because it imagines that all the other goals are shared and the same, without comprehending that once the international far Left is done with the “bad” Jews, the “good” Jews are next. Yesh Gvul and Peace Now accept money from foreign organizations and governments who do not have the best wishes for Israel in mind, and simply use our Leftists as tools to damage the Jewish people. These naïve dupes hurt Israel internally and externally in a way these international Leftists only dream they could. It’s a shame, because America thought it destroyed the Nazis in World War II, but unfortunately their legacy lives on in the form of the far Left. Nature abhors a vacuum. It’s only natural that an opponent to the US would arise after the fall of the USSR, and that is Islamic fundamentalism with Iran as the leader. The same with anti-Semitism. B’chol Dor vaDor. This time is the Far Left. Right outside my house they are building the Fence. I can’t say yet if I am inside or outside, as they haven’t quite gotten to the point where they go either left or right. But as I watch them rip and slash their trail of destruction through the land belonging to my settlement, across land of private (pre-State) Jewish owners, and of the Arab fields and villages adjacent to my house I can’t but see how evil the secular Israeli mindset is. I see once beautiful green areas destroyed and owners separated from their property. Not only has the secular Israeli given up, but they are trying to take down everyone else with them. Instead of real solutions, they want to stick their head into their shells like frightened turtles and hide. After all, if you pretend the problem is over there, then it can’t hurt you over here. And if we ignore Kassams falling on our heads, then there is still a ceasefire. And if we ignore the holes in the fence and the tunnels underneath it then the fence works. Two weeks ago they found major portions of the fence near Jerusalem ripped up and useless, except to the masses of Arabs passing through it unchecked and unimpeded. It appears that it was that way for a while, and no security forces knew even about it. Need we discuss the uselessness of the fence between Gaza and Egypt, or Gaza and Sderot and Ashkelon? But the Israeli government needs an easy solution it can sell to the people even if it doesn’t work. So now, my view is ruined, private land (both Jewish and Arab) is confiscated, and after Gush Katif last year, who knows if this government actually compensated the owners. And worse, there is a real solution to Arab terrorism. It’s called fighting it, and not with one hand tied behind your back. First of all kill the terrorists, don’t put them in jail as bargaining chips or whatever. Next forcibly expel their supporters. And finally offer (and actually pay) generous compensation packages to the remaining Arabs and assist in their voluntary immigration. For those that remain there are political solutions we have discussed in the past. In Lebanon the IDF went out of its way to not destroy civilian infrastructure that was being used by Hizbollah terrorists (yes they destroyed civilian infrastructures, but by far not enough and as a result it endangered the lives of our soldiers). The solution isn’t a pretend defense; the solution is a real offense. Ruining my view isn’t going to stop Arab terrorism – fighting it properly will. Makor Rishon has an interesting article about an archeological site found in Northern Syria (wiki: Ebla)- hopefully the article (in Hebrew) will be online next week. The site was found some 50 years ago, though apparently discoveries are still being made in it. For various reasons, the article equates it with the location of Yeshivat Shem v’Ever. Finally a reason to visit Syria (and not for the Humus). The site was a huge important city with a palace, library/academy, with tens of thousands of clay tablets covering all sorts of subjects such as birds of the world (classified by type), geography, literary texts, genesis stories, and lots and lots of names. And documents with the name Yah and El were found there along with those of the various Avodah Zarahs – which would chime in nicely with the story that when Rivkah passed by the Yeshiva, Yacov wanted out and when she passed by a makom Avodah Zarah Eisav wanted out. If you recall a few weeks ago the NY Times had an article about a major flood some 4800 years ago that could have wiped out 25% of the world’s population. Someone mentioned to me that this wasn’t our Mabul, but rather the major flood the medrash talks about that preceded the mabul during the time of Enosh. There is a current of revisionism running through MO Judaism lately and can be seen on a lot of well known blogs (and I’m not talking about the Bible critics here at all). Their idea is to completely explain away stories in the Torah as myth and moshals (and no, this is not an invitation to have that discussion on my blog) and fictionalize the people mentioned. Yet here we are, and a few months ago scientist found evidence of a major flood that no one knew of before. And we see a major center existed around the time of the Avos (which even mentions their names and other biblibal personalities of the time) – which could tie in quite neatly with our traditions relating to Yeshivat Shem v’Ever - not to mention it provides external validation to cities and locations mentioned in the Torah. There’s still a lot more we don’t know than we do, and sometimes a little patience is all that is needed to wait for evidence, science, and history to be uncovered –and discover that events the Torah mentioned are quite grounded in the reality that was around them. It’s important to read this article where one of the main archeologist of the site says there is no connection to Patriarchs, the Bible, or anything else despite any coincidental similarities in the names of the people and place mentioned in the documents found – while still confirming that it mentions all these biblical sites and names. It also reveals a lot of the political infighting between the various archeologists and how it affects and twists their interpretations. In fact it, reading the various articles (see the links at the bottom of this last link) we can see that the different interpretations of the various archeologists involved swing widely in different directions depending on their agenda – reminds me of Finkelstein. An interesting point in the article is how the Syrian government is putting pressure on some of the scientists to ensure that no Biblical links are found/published from the tablets and other items found. Of course, if Ur is located in Syria as some of the documents imply, that means that we Jews are aboriginal Syrians (to use Pattinato's phrase) – and that must upset them too. Another interesting side point is how the form of government used in Elba was similar to that of Israel’s. Its leaders (judges) were appointed (in fact, at one point they even had 7 year term limits!). This article opened up something very interesting, and I recommend reading up on this. But to return to my original point, this undercurrent of revisionism that is running around the MO world should really start to reconsider its position in light of recent findings. …or so you would think if you were a Leftist and naively believed Arab propaganda. In the past I’ve shown you hidden videos of Arabs cutting down their own trees, for which the settlers got blamed. Two weeks ago though, four Arabs were surprised and were caught in the act by officials. IMRA supplies a translation of a Hebrew article that discusses how Foresters caught 4 Arabs cutting down Arab olive trees. Even more interesting is that it seems the police are finally beginning to catch on to what’s going on. You see, the Arabs whose trees get cut down go to the Civil Adminstration and complain that the Settlers cut down their trees. The Israeli government then gives them compensation money!!! The police are now beginning to investigate the strange coincidence that nearly all the olive trees that are damaged, have been damaged... only at the end of the harvest season. Hmmmmm. They haven’t been reading JoeSettler. Yesterday and today much of the public sector went on strike. For a change I didn’t feel it, or even feel threatened by it (though I know people were affected), in fact my Post Office was even open, which was the only service I needed yesterday anyway. I just kept thinking, when Amir Peretz ran a strike as head of the mafia Histadrut we knew it was serious. The country would shut down for unknown lengths of time. His economic terrorism would cause billions of dollars in damages. The courts were ineffectual in breaking the strike (a shame they couldn’t prove to be so weak when it comes to their attacks on Judaism). But now he was completely out of the picture. Instead he is contending with his failure as Defense Minister, his failure as head of the Labor party, and his biggest failure - leaving the one place that actually made him one of the most effectively powerful people in this country, the head of the Histadrut. I’m actually completely disappointed with him. Here is a man who knows how to be destructive, who knows how to be vicious, who knows how to use force and pressure to get what he wants, yet when push came to shove he failed in his biggest test, the Lebanon War. While you might argue that perfecting economic terrorism is not the same as perfecting the defense of the country, I would argue differently. Both require the absolute desire to achieve your goal, destroying the will of your enemy, and convincing your followers to do everything in their power to make it so. Histadrut members crippled this country on the word of Amir Peretz, yet Amir Peretz couldn’t get his senior staff of generals to build up the required will to obliterate the Hizbollah enemy. I admit that Israel is economically socialistic, so he wasn’t fighting an uphill battle for acceptance of his Marxist ideology, whereas the country has been so brainwashed into surrender ever since Oslo and particularly Gush Katif, that he was fighting an uphill battle to convince his generals that the IDF is actually supposed to win, much less, actually fight the enemy. Peretz must be eating his heart out. He could have taken out this country for weeks if he was still the head of the Histadrut. The only other people capable of doing that are Hizbollah. Perhaps he’s playing for the wrong team? Daniel Doron wrote a wonderful piece about Milton Friedman, someone who very seriously influenced my understanding of economic theory and it's affect on and in the real world. You can read it here in the JP. I also recommend reading his books. At 6:00 AM Olmert surrendered to Hamas terrorism this morning. 75 minutes later, in continuation of their usual game of “Who me?”, Arab terrorists in Hamas occupied territories fired a Kassam missile into Liberated Israel. Thus transforming Olmert’s shameful and dangerous surrender to terrorism into an unconditional (shameful and dangerous) surrender to terrorism. They also shot three missiles just minutes before the Olmert surrendered. What’s interesting is how the Israeli government keeps surrendering. Starting with Rabin, then Barak, then Netanyahu, then Sharon, and now Olmert. Was Arafat (and now Abbas and Hamas) really wrong then in not accepting another Arab state on a silver platter (as everyone says)? The answer would appear to be an unequivocal no, he and they were not wrong. We’ve all talked about how the Arabs keep missing opportunities, but the reality is that they’ve simply had more patience and a longer outlook than the Left-leaning Israeli. Before, when the Israeli Left capitulated they felt magnanimous and superior. The Left were doing the Arabs a favor (while punishing the religious and the settlers – a double bonus). But the Arabs have their own plans. Yes, they want a State, but they want the whole one (Jew free except for Adam Shapiro, Amira Hass, and Tali Fahita). So they waited. They attacked. They harassed. In the end they got nearly the same regions Israel first offered them, but with absolutely no strings attached, and for a price that they consider free. But they got even more. They wore the Left down. They pushed the Left into a place where all the Left can say is “take, take, take”. But to add insult to injury the Arabs still say “no”, because they want it all, and know with their tactics they will get it. Olmert is considering bringing in Ehud Barach as his replacement Defense Minister. The man is a genius in one thing – running away. This past Lebanon war was possible, only because he turned tail. So now, the missile tempo from Gaza may slow down, but it will be just like in the North. The terrorists are rearming, repositioning, retrenching, and bringing in better, more advanced, and more daunting technology to attack us, while the border communities wait for the inevitable barrage that will destroy their lives once again. And Olmert and Co. will congratulate themselves, perhaps give a few undeserved promotions, and begin to discuss how to dismantle more Jewish communities to now surrender the biblical heartland of Israel. This will be as terrorist attacks from the Arabs in Judea and Samaria reach unprecedented levels. Moshe Feiglin wrote this weekend that the only response to this government is laughter at the level of ludicrousness and absurdity it has reached. Laughter has brought down bigger and more corrupt governments than Israel’s. He believes it signals their end. That’s very Breslevian of him. I wish he was right, but I (respectfully) disagree. I hardly see anyone making jokes of these jokers. Feiglin has a new (moderated) blog. Check it out. The JP has two excellent op-eds today. The first is by fellow blogger Israel Medad. It also appears on his blog here. 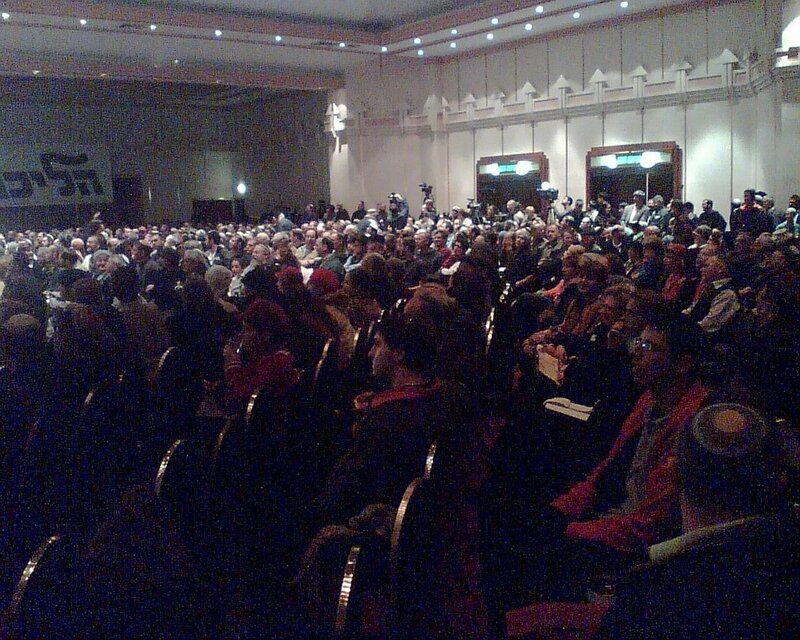 He discusses Peace Now's nonsense claims regarding land ownership under the settlements. A must read (Medad, not Peace Now). The second is by Evelyn Gordon who says "How to stop the Kassams". "Whenever politicians or army officers say that there is no military solution to the problem of Kassam rockets, my reaction is: Just how stupid do you think we are? After all, more than 1,000 Kassams have been fired at Israel from Gaza over the last 12 months, yet not a single rocket has been fired at Israel from the West Bank during this period. So unless you believe that West Bank terrorists, unlike their Gaza counterparts, have no desire to launch rockets - an assumption that defies both logic and the facts (the media periodically report on Palestinian efforts to start a West Bank Kassam industry) - the obvious conclusion is that the army has succeeded in preventing Kassam fire from the West Bank." Israeli Ambassador to the UN is under fire for asking the French how they would react if France was hit by cross-border missiles. Apparently you aren’t allowed to ask questions that raise the issue of moral equivalence. That is OK, because Yossi Sarid manages to whitewash Eichmann Barghouti, when he unequivocally said that the dispatcher of terrorists bears less responsibility than the terrorists he sends. He said even more, but it was all pretty vile. Meanwhile, Olmert is threatened by the success of Arkady Gaydamak’s vote buying. I personally have no problem with Arkady using his wealth any way he pleases, and while I can think of better ways to help the people of Sderot, all I can say is “Good for you Arkady”, if this helps out the people of Israel, and makes you more popular in the process – just don’t turn into another Sharon and twist your power and influence into something evil. It turns out the fence is what in Israel is called an “Israbluff”. Doesn’t work, doesn’t do anything. See for yourself. There was a nearly successful attempt to blow up an El Al plane (and others) in Germany. The plot was foiled because the terrorists didn’t offer enough money to the baggage handler. B”H Arkady is on our side. Olmert & Peretz are fighting with each other. Who cares. And suprisingly Dalia Itzik actually said one thing smart today when she said the Supreme Court shouldn’t have the right to invalidate laws passed by the Knesset (In my opinion it probably does not have the right, but merely grabbed it and no one had the guts to fight Barak). And one smart thing is always better than none. And that’s the news, and I’m outa here. If you harbor terrorists, you are terrorists. If you train or arm a terrorist, you are a terrorist. If you feed a terrorist, or fund a terrorist, you're a terrorist -- and you will be held accountable by the United States and our friends. Is someone who protects a known terrorist innocent, or are they accessories to terrorism? In line with the general idiocy of the left when it comes to defending Israel, the state has displayed what I can only describe as a series of idiotic concessions to terrorism. First of all, it is now revealed (well, we knew it already) that it is apparently IDF policy to warn terrorists that the IDF is about to bomb their house. Secondly the Palestinians, understanding the Left’s weakness got smart. This time they sent 100 supporters of terrorism to protect the house and terrorist - by acting as human shields. And as they predicted the IDF backed down. If these Palestinians willingly want to protect terrorists and their property – then they have become accessories to terrorism too and are legitimate targets. Wake up Israel. (The UN is going to blast us anyway). And this is more interesting because in the wake of Beit Hanoun, the press is reporting that residents are now trying to stop the Kassam launchers from launching near their homes. (I’ve discussed this in the past). "Some in Beit Hanun were saying that after the shelling last week of the Al-Atamna family and the extensive killings of civilians, some prominent local families had expressly threatened members of the Qassam cells. In one instance, they say, an armed man identified with Fatah put a gun to the head of a Hamas activist who was busy laying cables to launch a Qassam rocket. The message was clear; the would-be launcher ran away." It’s time Israel learned that given the right incentives the Palestinians will stop terrorism on their own. Taking out the 100 supporters of terrorism would have provided great incentive for them to stop further attacks, and not try such a stupid thing again. Instead the IDF displayed the crippled morals of the Left and decided to let our deterrence and fear of the IDF drop to the point of pretty much no return. As an interesting/disturbing point of information, I returned from counter-terrorist training where I spent much of the time as the terrorist. I learned quite a bit about terrorist tactics, but the most interesting thing I learned is how a terrorist thinks. Let me be quite unequivocal here. Any terrorist sent on a mission (if he’s had any training whatsoever) is 100% aware in advance that no matter what weapons he brings with him (suicide belts, grenades, machine guns, knives) into a settlement, he is going out on a suicide mission. Period. I played out dozens of scenarios and short of surrender before the attack (and occasionally cut-and-run if he is very lucky), there is pretty much no way for a single or small group of terrorists to survive the counter-assault (going in as a larger organized unit is different). Their goal, once inside, is to kill as many people as possible before being killed. There is no alternative. There is no escape (except to Allah). This is the mindset of any terrorist that crosses the border into any settlement. It’s important to keep this in mind when considering what they are planning to do as it defines every action they will take. Here is a very interesting website to read. Perhaps there is hope. General Barnicke: Where have you been soldier? General Barnicke: What kind of training? John Winger: Aaaaaarmy training, sir. General Barnicke: Are you telling me that you men finished your training on your own? John Winger: That's a fact, Jack. Soldiers: That's a fact, Jack. I don’t know how many people have noticed the little green bar on the right side of my blog. It’s a counter that counts days, specifically the numbers of days since our soldiers were kidnapped and Hizbollah hasn’t been disbanded. Unfortunately the counter has reached a milestone. It has broken 90 days. The Reservist Protest at the Knesset also folded up its tent today. And as expected, the current inquiry didn’t really find the real culprits (that commissioned the inquiry) except for a few scapegoats (some guilty – such as some generals, and some not – such as the reservists). And meanwhile Olmert plans to expel more Jews. Life in Israel moves on as if nothing ever happened and no one has learned anything. 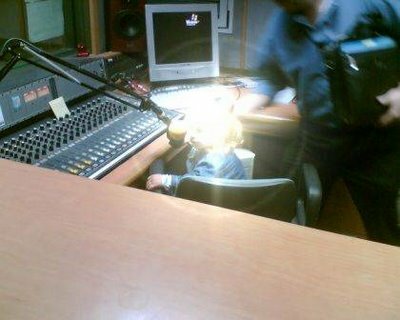 Through an unplanned and unexpected turn of events, a disguised JoeSettler (and family) went and visited the offices and studios of Arutz-7 this evening (which someone had left accidentally open, unlocked, and mostly unattended – which made the whole outing possible). Here are some photographs from inside this secret location. 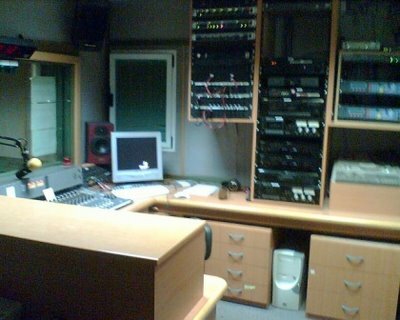 To begin with, outside the building are prominent signs explaining that the studio broadcasts over the internet only and not the radio – for obvious reasons (not that one should assume the cops can read). 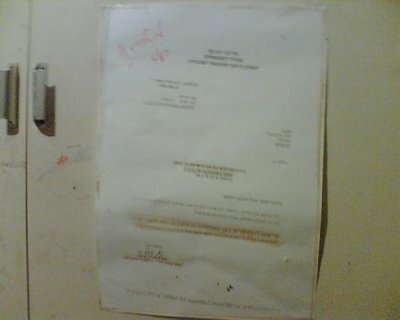 Inside, as you walk in is a letter from one very prominent Leftist to another very prominent Leftist, demanding the government immediately stop funding Bar-Ilan University as they advertise on the Arutz-7 website and internet show – which in his eyes must be completely illegal to do (unbelievable!) . And talk about an ipodcasting studio! The Arabs, for some reason, are all worked up that they caused the death of their fellow Arabs in Beit Hanoun when they attacked Israeli citizens from within (or around) that town. The Arabs really have Chutzpa when it comes to venting at Israel for hitting them back - but the world accepts it, so why not? S.P.Q.A. does an interesting analysis on how Arabs really estimate and assess the value of the lives of their fellow Arabs (it includes Iran too, so it is perhaps more of a Islamic estimation on the value of their lives) . "You can read my lips: 'I'm ready for territorial compromises‚ and I haven't changed my mind," Olmert said in an interview with Newsweek-Washington Post. In the interview, Olmert breathed new life into the realignment plan, which would see Israel retain highly populated settlement blocs within Judea and Samaria and relinquish isolated areas. 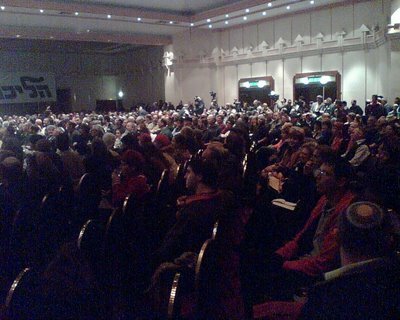 Until now, analysts had assumed that Olmert had dropped the plan. And why wouldn't he restart his realignment plan? He now has Lieberman in his pocket, shoring up his coalition against any chance of collapse. He even hinted he would give away the Golan to Assad. The Left can never learn from (even recent) history, and those that are in it for the power don’t want to learn. Hatred of Judaism and of Religious Jews is a powerful thing in Israel. 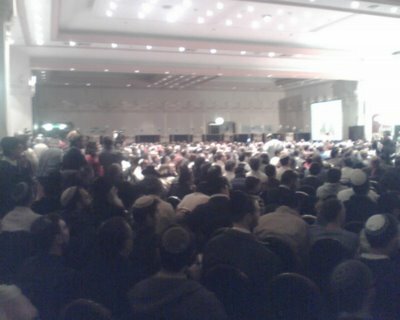 In the State of Israel there are people are willing to lose a hundred million dollars - just to spite Jews and Judaism. The McDonald franchise in Israel is owned by Omri Padan – not someone known for his favorable attitude towards Judaism (understatement). There is a McDonalds that sits in the Ramat Aviv mall. The Ramat Aviv mall is owned by Lev Leviav – a religious Jew who keeps his malls closed on Shabbat. In 1997, Omri Padan said, he “will not surrender” and make his Ramat Aviv McDonalds kosher – even though it was already to be closed on Shabbat. In the year 1999, the Avi Chai Foundation did a study that found that 58% of the Jewish population in Israel will only eat kosher (and if that didn’t specifically include basar v’chalav, they also found that 44% of the population keep completely separate dishes for milk and meat). Yet strangely enough (well not ,when you consider the hater), Omri Padan, with the hurdle of not being open on Shabbat no longer an issue, made an unambiguous decision to choose to not serve over 50% of his potential clientele. Now there are those of you that are whispering that is would cost him more to be kosher – I will remind you of his obscene TV commercial where he said that the meat and cheese that comprise his cheeseburgers are all kosher products. So, with a 50% population that only eats kosher (and at no extra expense), Padan chooses to keep less than 10% of his McDonalds kosher, and even then it is when he had no choice (such as in the Jerusalem Bus Station which will only allow kosher vendors). More so, he chooses to keep them non-Kosher particularly in Jerusalem where far more than 50% of the residents keep kosher. I would assume that McDonalds (with their respect for local values and customs, even though they even make mistakes at home) quickly realized that they made a huge mistake giving Padan an (apparently) exclusive countrywide contract. They must not have know he was an extremist. But they certainly realized soon enough that they had locked themselves in with someone who was willing to put his Hate before their bottom line. This week, McDonalds (USA) acknowledged their mistake when they unilaterally decided that Padan must comply with their wishes and make his Ramat Aviv restaurant Kosher – against his will. Furthermore, McDonalds has made the decision to modify their signs to clearly differentiate between kosher and non-kosher branches in the same towns, resolving the issue that the Rabbinate won’t mix and match kosher certificates where the public (residents and tourists) might be easily confused. McDonalds even has a precedent for altering their signs when they modified their signs in France to comply with French legislation on store signs. In short, it would appear that McDonalds USA is finally beginning to wake up and realize that Padan’s hatred must be scrutinized and restrained – because it is limiting their growth in the Israeli market. And if you didn’t know it, Omri Padan is also a founder of the hate group Peace Now - which explains why there is no McDonalds anywhere in Yesh(a). Burger King, on the other hand, did open “over the green line” in Maaleh Adumim (annexed by Israel if you don’t remember), but Gush Shalom, Peace Now’s doppelganger, ran a campaign which shut it down. Personally, I would tell McDonalds that while I appreciate their concern for their bottom line, they are wasting their time as I have far too many friends and acquaintances who will not eat at the Kosher McDonalds so as to not financially support Omri Padan and his Crusade of Hate. To begin with before you even think to comment here, read this first. There is no doubt in my mind, come Sunday we will begin to see headlines and articles declaring the revealed limits of Chareidi power, how the Chareidim are no longer the Masters of Jerusalem, and Yair Lapid will of course come out with a daring piece declaring everything he couldn’t say before the parade as to the real reasons he actually supported the parade. And all these articles will show what we already saw last year and what we knew from long before. These various destructive, antagonistic, and provocative actions aren't and weren’t done for the “good of the nation”, but rather to hurt specific sectors as Lapid proudly brayed in his recent article. And isn’t that what we are really talking about here? While certain sectors yell and scream “Freedom of Expression”, “Freedom of Speech”, and of course “Freedom from Religion” I only see thousands of police and soldiers being deployed to kick Jews out of their homes, and to protect a purposely confrontational parade, but when it comes to protecting our rights, I don’t see anyone deploying those same forces to allow me to safely pray on the holiest site in Israel – the Temple Mount. In short, we see through this façade of liberalism and openness and recognize that Yair Lapid showed the real face of his society – hatred of the Torah and Judaism and those they believe represent it, and nothing less than that. This is a culture war, and it is far easier (for the Left) to destroy than (for the Right) to build. When the thousands of Gush Katif expellees receive permanent housing, when I can openly and safely pray on the Temple Mount, when Jewish citizens of Yesh(a) aren’t thrown into administrative detention or barred from their homes without charges or having committed any crime, when the police protect and not beat up someone blowing the Shofar on Rosh Hashana at the Kotel, then I will quite possibly begin to consider that things have changed. But until then all the evidence proves me right. There is no doubt (as Sharon proved) that Israeli politicians are the worldwide experts at openly manipulating and circumventing the law to their personal benefit. As the Jerusalem Post article on Shimon Peres shows, Israeli politicians can be broken up into two groups. The first, those that openly break the law and get caught. The second become so intensely familiar with the law, they can openly take the same exact improper actions but without “officially” committing a crime. Peres’s Center for Peace alongside Peres’s “Peace Technology Fund” is one such dubious example of questionable financial activities and political conflicts of interest. Donations and investments go in and out of different Peres Pet Projects, yet somehow Peres comes out of it completely clean (or the investigations are inconclusively closed, or never opened in the first place as we see today), even as his investments and political activities intertwine and create clear conflicts of interest when it comes to what is good for Israel. So now Shimon Peres won’t be charged (surprise) for illegally receiving some very large donations because he managed to time it exactly so he received them during a two-week limbo period. His behavior, just like Sharon’s and Olmerts is the standard for Israeli political society. He is simply smarter, and better connected than many other politicians (and certainly must have juicy stuff on a lot of people), so he gets away with it – at the country’s expense. We don’t even need to discuss administrative detention against (obviously settler) Israeli Citizens, one just needs to look at Peres see the Rule of Law in Israel is one broken rule and the attitude towards it is that it is just a tool to hit your opponents over the head with. One of the most ubiquitous scenes in Israel are Israelis throwing barbeques on Yom HaAtzmaut, so many Israelis that they even will set them down in the middle of an island on the highway for lack of room anywhere else. I am not the first to note the (instinctive) connection between the development of this custom and the sacrifices we used to offer in the Beit HaMikdash. In fact, before the Temple was centralized, people used to offer sacrifices everywhere – in other words - barbeques. Outsiders apparently tend to see sacrifices as some primitive throwback to idolatry, yet it was anything but. It is many things, but one thing it certainly is, is the elevation of a mundane process (slaughtering, cooking, and eating) into something more sublime. It is an expression of gratitude to G/d and recognition that not everything is ours, even when we think it is, and we have to return something back to the Giver, if when it is not something needed by the recipient. But think about it, the Beit Hamikdash was more than just a Steak House. Picture what was going on there. There was a house band (the Leviim) that would sing and play in the courtyard – even on Shabbat. People would come to offer their sacrifices and hear their favorite music as the dinner was cooked and served. I was thinking that during Elul they probably played a variation of “Knocking on Heaven’s Door”, Nissan was of course “Smoke on the Water, Fire in the Sky”, and in Bayit Shlishi I won’t be surprised to hear a variation of “Lola” on Purim. Simchat Beit HaShoeva must have been like a Music Festival with different bands in different sections of the courtyard. Of course the house band changed every month so it never got boring, and I’m sure each Cohen Gadol had his favorites tunes that set the tone for his tenure. I little more of the Ramones for Ezra, while Aharon preferred Billy Joel. And once your animal was slaughtered and freshly cooked, you sat down to eat with your family, perhaps with the new fruits if the season was right. The music of Kol Achai for your listening pleasure. And the scene! Imagine the Inbal (formerly the Laromme) Hotel on the first night of Sukkot or Pesach. Nothing compared to what was going on around the Beit HaMikdah. Friends meeting, eating meals together, and celebrating whatever they were celebrating. And elevating their meals and evening whether personal or national into something more than just physical into something holy and meaningful. Personally, I can’t wait until the third Beit HaMikdash is rebuilt. 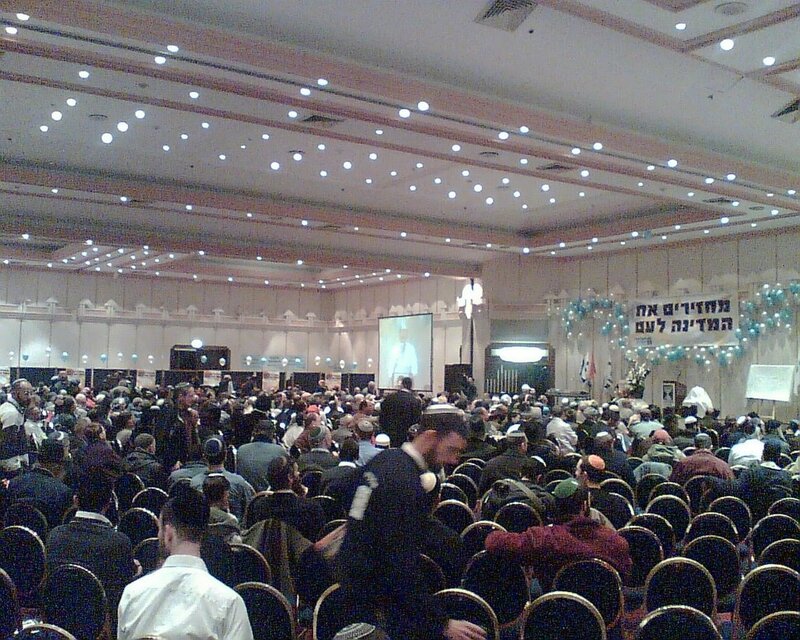 Well, the Reform movement has finally inaugurated its first public fast day. They are calling it the Fast of Rabin. Personally I plan to adhere to it as religiously as every other Reform Jew in the world adheres to every other Jewish fast during the year (with the possible exception of Yom Kippur). And so, exactly like every Reform Jew in the world will be doing on that particular day, I will be doing the same thing - Yes, I will be eating. What’s interesting is that they are calling it that probably to raise a similarity in your mind to the Fast of Gedalia (uh, how many Reform Jews know who he was to make the connection?). But there is one main difference. Gedalia’s assassination essentially brought about the end of Jewish independence and habitation in the Land of Israel. Really, there isn’t really much difference between one guy killing Rabin, verses Rabin, Peres, and Beilin giving the Arabs lots of weapons and free access to kill lots of Jews, except that Rabin, Peres, and Beilin are directly responsible for the deaths of lot more Jews than “he who shall not be named”. But I guess when you outsource it’s easier to evade liability (or maybe it’s a numbers game, and you need to kill a lot of people, like all those on the Altalena, in order to go scot free). Oh and Gedalia was a tzaddik, so there may be two main differences. Anyway, as always, remember to make your annual pilgrimage here. And here is a rather intriguing photo and video. There seems to be some confusion as to what the JoeSettler blog is about. There are those that think they can use it as their soapbox for whatever they believe in. There are those that think it is a place for dialogue between diverging viewpoints. There are those that think it is a place for rebutting what I say (or at least making the attempt). I hear leftist and anti-religious drivel all day long on the news, from my friends, and from my colleagues. I started this blog because the Left decided to expel 8000 Jews from their homes – and this is my answer to your evil act – whether you participated, anticipated, or simply appreciated it. This is a blog about, and from the perspective of Israel and Torah Judaism, with emphasis on the Torah mandate of conquering and settling all of Eretz Yisrael (from Tel Aviv to Rafiach Yam). The objective of this blog is to promote a Jewish State in Eretz Yisrael as opposed to a state full of Jews like we have now. If your opinions are anti-Torah, I’m not interested in seeing them here. Don’t take it personally (or do take it personally, that’s your business), but my site isn’t here for promoting your ideas or creating dialogue. Nor am I interested in wasting my time arguing with you when your philosophies and values are so diametrally opposed to mine. When you start off so wrong on the basics, any common ground is transitory, and ultimately the conclusions will be in opposition. Sharon proved that last summer. JoeSettler is for promoting my ideas. If you want clarification, that might be one thing, but if you want to argue. Go away. I’m not interested. I’m sorry if you don’t like my attitude on my blog, but too bad. I’m forced to hear your type of drivel all day long and this is my place to vent. It never fails. Whenever my Left-wing acquaintances speak, I never fail to walk away with the feeling that I am listening to a parody of everything I read in the paper, whether it be that missiles are no threat, or disengagement is good for Israel, or whatever other nonsense is being spewed that day. Last night I think they outdid themselves. I mean, true, I’ve heard similar statements like it from MKs and Leftist organizations, but to hear it in person from a typical secular leftist I know, it was like watching a parody on TV. I sat there in utter bemusement as one said, “Peres is an honest man, and everything he does, he does for The Peace.” (Yes, she managed to capitalize the letters when she said them in Hebrew). I could barely restrain the laughter, it was like watching “Eretz Nehederet” but actually being in the audience. In other Parodies that have occurred recently, A Yitzhar resident was arrested for living at home, and another 2 arrested trying to get home. That’s not so bad I guess, because Jewish residents in the Old City aren’t even allowed to leave their home. I wonder who has it worse? 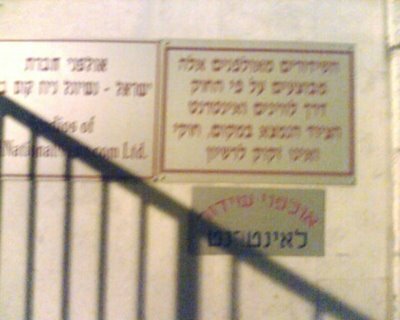 (IsraelNN.com) A Yitzhar resident was placed under arrested after he was found living in his home in Yitzhar. The suspect is prohibited from entering any Samaria community as per an IDF administrative order.The suspected will be remanded in a Petach Tikvah court on Friday morning. (IsraelNN.com) Authorities on Wednesday night arrested two Israelis in the Samaria community of Yitzhar, reportedly for violating an IDF order prohibiting them from entering the community. The military order was signed by Central Commander Major-General Yair Naveh. IsraelNN.com) Police have notified residents of Jerusalem’s Old City that during Ramadan, Haggai Street heading to the Kotel (Western Wall) will be closed to Jews from 10pm until midnight. Jerusalem officials explain the move is to avoid skirmishes between Jews and Muslims following Ramadan prayer services on the Temple Mount. And talk about too little, too late. The guy is retiring and only now decides to question the disengagement. Nationalist activist Itamar Ben Gvir reacted to outgoing IDF Chief Rabbi Brigadier General Rabbi Yisrael Weiss’ comments that he fears that the disengagement was for nothing.“His apology is not enough for the thousands of Jews whose lives were destroyed after they were expelled from their homes,” said Ben Gvir. He continued, “It is strange that a year and two months after the expulsion, all the collaborators remember to apologize. When were they then?” he asked. And talk about timely answers. Despite video tapes of Arabs destroying their own trees and blowing themselves up, the Left simply can’t imagine why a Palestinian would harm his own trees. Do trees and olives take longer to grow up than Arab children do when they are sent out to blow up? Or do Leftists simply believe that Arabs value their trees more than their children? However, Emily Amrusi, a spokeswoman for the Council of Jewish Communities of Judea, Samaria and the Gaza Strip, said that 90 percent of the stories of settler violence against Palestinian farmers were exaggerated. Amrusi said the council even has video clips, which they released last winter, which show the Palestinians harming their own trees. [Palestinian coordinator who works with Rabbis for Human Rights, Zachary ] Sadeh discounted such films as illogical. Why would Palestinian farmers harm trees that take so many years to grow and on whom they rely on for economic sustenance, he asked. some 100 oak trees in the Hevron Hills area near the community of Beit Haggai. Ah. Nothing like some parodies to make your Friday complete.